Breaking News! Coffee reduces cancer! Extra, Extra !!! Well, I apologize for this kind of heading, but I want you to be ready for the onslaught of “news” this coming weekend that will be generated by hundreds (thousands?) 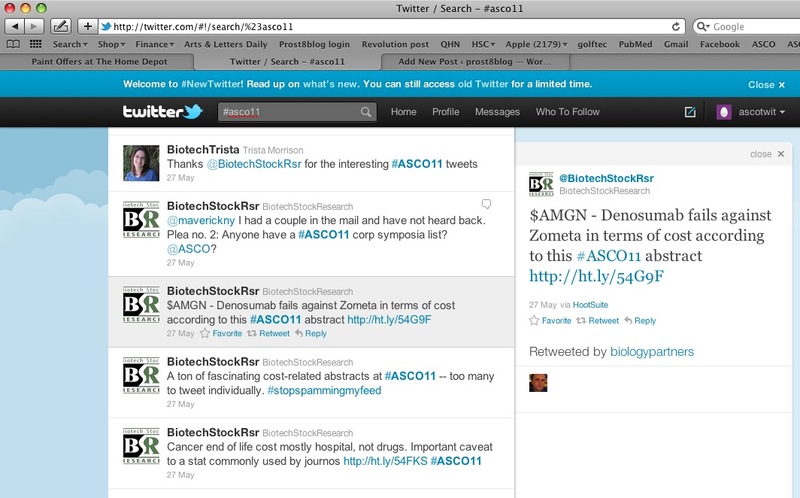 of reporters, bloggers, and financial analysts who attend the American Society of Clinical Oncology meeting in Chicago. It is worthwhile noting the differing agendas of the participants, and then I want to give you a lesson in how to put some perspective into the “new findings” that will be on the evening news and flood the Internet for the next 3-4 weeks. The next agenda may often be a pharmaceutical company. These are harder to really get at, since much of the “news” is actually sponsored by pharma but appears in “cancer news publications”. In such cases, the reporter might be writing a number of articles that are completely legitimate “news”, but behind the scenes, with so MUCH news at a meeting like this, and with so MUCH money at stake, it is not at all clear that there isn’t an invisible hand that selects some stories over others. In the case of huge stories, the authors are shepherded into special rooms for interviews, some by news organizations, and some by pharma selected news outlets etc. The mixture of marketing and science is a complex one – when we presented the first data on Lupron 25 years ago, I had no idea of the sophistication of such endeavors. If you want to read about how it all works, I strongly recommend “White Coat, Black Hat – Adventures on the dark side of Medicine”, by Carl Elliot. In some cases, articles are “commissioned” years before the launch of a new drug which “review” the negative side effects of an existing competing drug. I’m not attacking pharma here – I have benefited personally, financially, and academically from working with many fine companies. But reality is an important part of understanding “the news”. So, since so many patients pointed out the “news” about coffee and prostate cancer, here is how I go about adding context. The original article that was picked up by the media appeared about 2 weeks ago in the Journal of the National Cancer Institute and found a reduced risk of lethal (but not low grade) prostate cancer among men in the Health Professionals Followup Study who drank 6 cups of coffee daily. In this case, the media was alerted to the study by a press release from the Harvard School of Public Health – another form of drawing attention to an institution. (Lots of previous studies have found that coffee drinking can reduce cancer risk from all kinds of cancer – this wasn’t really “news”) If you click on the press release link above, you will find that it goes to a website called “eurekalert.org” – yes, there are organizations who will advertise your “breakthroughs” to the public – encouraging human interest “news” articles. By the way, in this blog, I will always try to include links (underlined) that I encourage you to click on to see the source of the topic being discussed. When you do this for “coffee” and “cancer”, you will find dozens of articles, including “meta-analyses” of studies on prostate cancer. Meta-analyses look at multiple studies to try and find out what a compilation of studies like the one from the Health Professionals Study have found. One such meta-analysis concluded that coffee drinking increased the risk of prostate cancer in 7 studies and had no effect in 4 other studies. So – have a great week and look forward to all kinds of positive news coming out of the ASCO meeting, but remember, in the age of the Internet, you can be a very sophisticated consumer of “breakthroughs” and before getting too excited or too depressed, do a little homework. Our experience with cancer is a journey, much like life itself, and in general most advances are small steps forward – not what the headlines scream at us. There will be 496 abstracts on prostate cancer to comment on this week alone! Now that you know the source, write your OWN headline. I agree with your thoughts,”Our experience with cancer is a journey, much like life itself, and in general most advances are small steps forward – not what the headlines scream at us. There will be 496 abstracts on prostate cancer to comment on this week alone! Now that you know the source, write your OWN headline”. The press often dramatizes the “small steps” in PCa research that are presented as, “breakthroughs”! We PCa patients hang on every new article that might be a REAL BREAKTHROUGH! Maybe some day a “small step” will not just be a “band-aid” but possibly a real cure? I hope there will be a cure too, but I don’t think it is likely that any metastatic epithelial cancer will be curable in our lifetimes. The new agents that are developed with all of our new knowledge aren’t “band-aids” per se (not at thousands of dollars/month of life saved), but they really face a daunting challenge. Breast, Colon, Lung, and Prostate cancers have a huge number of mutations by the time we detect them, including mutations that accelerate the mutation process itself. Thus they carry the ability to adapt to almost anything we come up with, and they usually do. I think the best we can hope for is converting these cancers to a chronic illness, like diabetes or arthritis. In the end, we human beings aren’t designed to be “cured”, only to live about 80-90 years before something gets us. More and more of us live to that age, but even then, it will never be 100% of us who make it that far – I think of it as the price we pay as a species for carrying a plastic genome that got us here in the first place.